Is this an American Bear? I have a bear that I was given to me by my father in the 1950s. He worked for the liners that went from Liverpool to the USA and often brought us presents that he bought in New York. My sister was also given a smaller bear which has always been called Teddy-from-New-York. 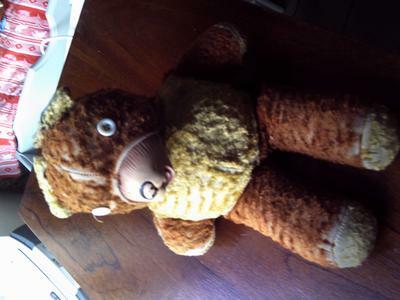 My bear is very well worn but was once brown and yellow. He has a long snout made of what feels like plastic (now rather cracked). He is stuffed with sawdust but remarkably soft despite this. He used to have brown eyes made of glass or plastic but they were long ago replaced by buttons. As I used to carry him everywhere by his ear one of them is just hanging on. He has been sewn and repaired many times so is rather disreputable looking. I would be interested to know if he actually came from America. I believe his present extremely play worn condition rules out any value however. 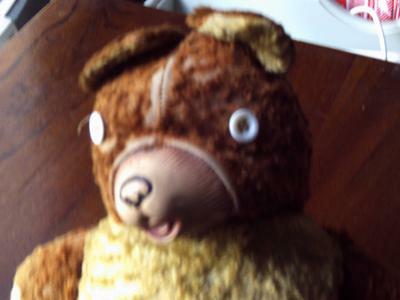 It is very difficult to try and identify this bear as he has lost many of his original features which are often used to help with identification. He does look like he has been well loved and that is what every teddy bear should be. I have looked through my books and I can't find a match but he does have some characteristics of a Wendy Boston toy. The round ended feet short arms and general construction makes me think he may be a Wendy Boston Bear. However Wendy Boston bears were made in the UK and were very popular at that time. Later the company became known as Play safe toys. However someone else may know of an American bear from that time that has similar looks and may comment here. I'd love to see a photo if you possibly can. the plastic snout always seemed to me to make Tubby Teddy different to the teddies my friends had. 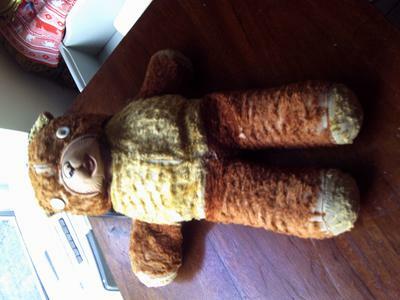 I just purchased this OLD Teddy Bear and it looks exactly the same as yours except for the color - black/tan instead. It is stuffed with a grey colored cotton like stuff that I have seen in very old quilts. I would LOVE to have any information on it. That's very interesting, Pat. My bear doesn't have a tail but the American connection seems similar to your bear. I wonder if they were made in UK as suggested but sold in the shops on board the liners. I guess we'll never know and Tubby Teddy ain't saying!